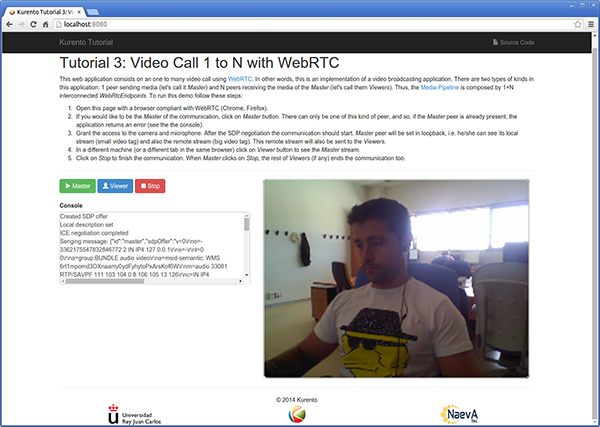 This web application consists on a one-to-many video call using WebRTC technology. In other words, it is an implementation of a video broadcasting web application. This tutorial has been configured to use https. Follow the instructions to secure your application. First of all, you should install Kurento Media Server to run this demo. Please visit the installation guide for further information. The web application starts on port 8443 in the localhost by default. Therefore, open the URL https://localhost:8443/ in a WebRTC compliant browser (Chrome, Firefox). 1. A Presenter enters in the system. There must be one and only one Presenter at any time. For that, if a Presenter has already present, an error message is sent if another user tries to become Presenter. 2. N Viewers connect to the presenter. If no Presenter is present, then an error is sent to the corresponding Viewer. Viewers can leave the communication at any time. 4. When the Presenter finishes the session each connected Viewer receives an stopCommunication message and also terminates its session. 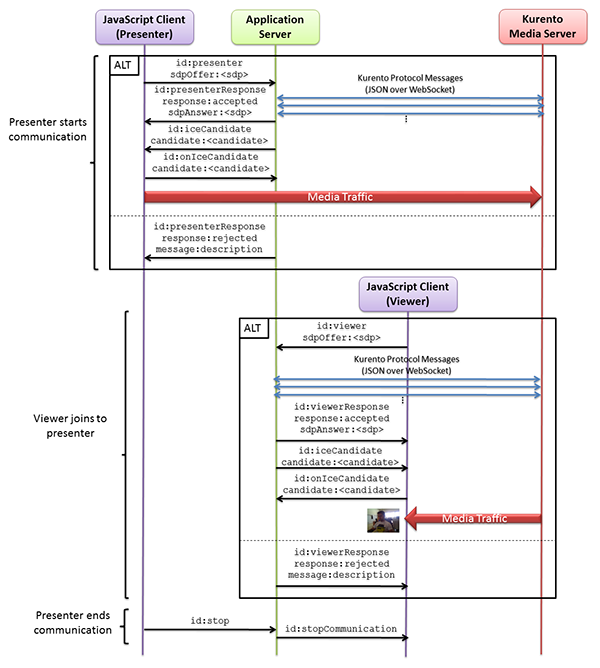 As you can see in the diagram, SDP and ICE candidates need to be exchanged between client and server to establish the WebRTC connection between the Kurento client and server. Specifically, the SDP negotiation connects the WebRtcPeer in the browser with the WebRtcEndpoint in the server. The complete source code of this demo can be found in GitHub. This demo has been developed using Java in the server-side, based on the Spring Boot framework, which embeds a Tomcat web server within the generated maven artifact, and thus simplifies the development and deployment process.  You can use whatever Java server side technology you prefer to build web applications with Kurento. For example, a pure Java EE application, SIP Servlets, Play, Vertex, etc. We chose Spring Boot for convenience. The main class of this demo is named One2ManyCallApp. As you can see, the KurentoClient is instantiated in this class as a Spring Bean. This bean is used to create Kurento Media Pipelines, which are used to add media capabilities to your applications. In this instantiation we see that a WebSocket is used to connect with Kurento Media Server, by default in the localhost and listening in the port 8888. This web application follows a Single Page Application architecture (SPA), and uses a WebSocket to communicate client with server by means of requests and responses. Specifically, the main app class implements the interface WebSocketConfigurer to register a WebSocketHanlder to process WebSocket requests in the path /call. CallHandler class implements TextWebSocketHandler to handle text WebSocket requests. The central piece of this class is the method handleTextMessage. This method implements the actions for requests, returning responses through the WebSocket. In other words, it implements the server part of the signaling protocol depicted in the previous sequence diagram. In the designed protocol there are three different kind of incoming messages to the Server : presenter, viewer, stop, and onIceCandidate. These messages are treated in the switch clause, taking the proper steps in each case. 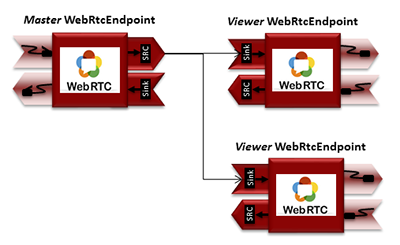 The viewer method is similar, but not he Presenter WebRtcEndpoint is connected to each of the viewers WebRtcEndpoints, otherwise an error is sent back to the client. These libraries are linked in the index.html web page, and are used in the index.js. In the following snippet we can see the creation of the WebSocket (variable ws) in the path /call. Then, the onmessage listener of the WebSocket is used to implement the JSON signaling protocol in the client-side. Notice that there are four incoming messages to client: presenterResponse, viewerResponse, iceCandidate, and stopCommunication. Convenient actions are taken to implement each step in the communication. 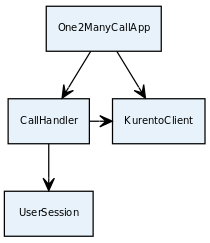 For example, in the function presenter the function WebRtcPeer.WebRtcPeerSendonly of kurento-utils.js is used to start a WebRTC communication. Then, WebRtcPeer.WebRtcPeerRecvonly is used in the viewer function. We are in active development. You can find the latest version of Kurento Java Client at Maven Central.